A model of one of the Mars Exploration Rovers traversing a red planet mock-up. Two robots thesize of golf carts were given 90 days to squeeze as much science as possiblefrom the barren, dust-swept terrain of Mars. After that, scientists expectednothing more from them than death. 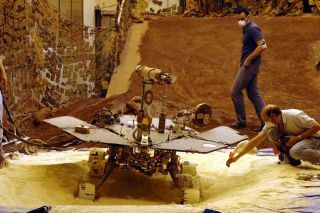 Nearly fouryears after their warranties expired, however, the MarsExplorations Rovers (MERs) "Spirit" and "Opportunity" continueto play productively in the red dirt. Spirit celebratesits fourth anniversary of Martian work on Jan. 4, the day it landed in 2004, followedby Opportunity on Jan. 25. Those four Earth years since landing convert to 2.25Martian years, or 1,422 Martian days called "sols." "Wenever thought we'd still be driving these robots all over Mars," said Mark Lemmon, a planetary scientist at Texas A&M University and member of the rover science team. "Wejoked about driving Opportunity into Victoria Crater, but now we're there, andwe're looking at doing even more science. Each day they still work is an amazing one." Since therovers bounced onto Mars' surface, they have collectively driven more than 11.8miles (19.1 kilometers) and snapped more than 210,000 images. That's roughly 55standard DVD movies worth of uncompressed data. Scientistshave used this information through the years to crank out more than 100 studiesabout the planet's geologic past "with many more in progress," Lemmonsaid. "It'sbeen a great year for the rovers and we're getting deeper into Martian historythan we've ... done before," Lemmon said. "These robots haveentirely changed the way we view Mars." Those viewsinclude support for the existence of wateron Mars, at least in the past, in the form of silica and meteorites. In additionto that evidence, the year 2007 inflicted a global dust storm on the rovers. Althoughindirect sunlight powered the rovers through the dusty conditions, more than 96percent of direct sunlight to their solar panels was filtered out. "Itwas scary there for a while," Lemmon said of the low-light conditions thatnearly drove the rovers to a permanent standstill. Despite thenerve-wracking task of keeping both rovers power-positive — and their electroniccircuits from snapping in the Martian cold — Lemmon explained that new scienceis still trickling out as a result of the weather event. "TheMars orbiters looked down on the dust storm when it happened, but they didn'tmeasure changes on the ground like the rovers did," he said. "Therovers are really helping us to better understand these storms." Now that thedusty, five- to six-month Martian summer is waning and winter is creeping up, earthlyoperators have pinned down an over-winter parking spot for Spirit. The roversuffered software glitches early in the mission, and now drives backward as itsfront right wheel is indefinitely stuck. Making matters worse is the literalfallout from the recent dust storm. "Rightnow, we're working with the dustiest rover we've ever had," Lemmon said,who does not expect whirlingdust devils to clean off the rover's coated solar panels any time soon. "As a result, we pretty much consider Spirit parked." Lemmon said Opportunity, however, is in good shape to continue exploring and the team hasno definitive date for parking the adventurous machine. "Opportunity has much cleaner [solar panels] than Spirit," Lemmon said, "sothere's no discussion of racing it to a north-facing slope for thewinter." Scientists usedthe north-facing-slope trick in the past, which helps maximize direct sunlightto the rover's solar panels during the dim Martian winter. While Opportunity continues to maneuver around Victoria Crater, Spirit is presently resting on aslope of Home Plate — a layered outcrop of rock in the shape of a baseball homeplate. "It'll stay in one place for a long time, but we'll still be ableto do some science," Lemmon said. That scienceincludes watching the sky for water-crystal clouds and taking atmosphericmeasurements, but the rover may also witness a potentialasteroid impact later this month. "I'm not optimistic for the rovers seeing anything ? [but] we have some hope of seeing the impact cloud as it disperses around theplanet," Lemmon said. "I like the thought of a birthday present fromMars. It'll certainly contribute more excitement to the mission."